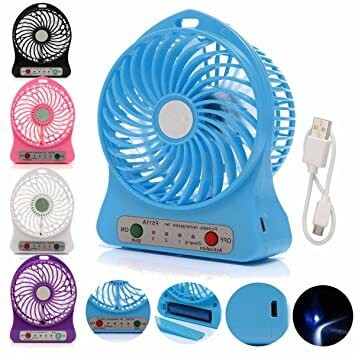 A mini fan is as the name suggests, a miniature fan. The size of a mini fan makes it extremely convenient to carry around. It is designed to serve the purpose of serving a single user on a hot day. There are portable models available that can be carried around on the neck. The components used are mostly minimal in nature and as a result, they are quite light weight. Most mini fans are battery operated, although a few slightly larger models may be constructed for direct charging or even USB charging. Mini fans are best suited for travelers in hot, humid regions. Simply to manufacture, a large quantity of these fans are made by Chinese and Japanese companies for worldwide export and home use. The making charges are also quite low, especially in bulk manufacturing. Some prominent manufacturers include Kowloon Technologies, Kawachi Group, Powerpak, and Atomberg among others. Common Motor: The common motor is pressed against a gear to bring about the rotation of the fan blades. It is generally built into the stem of the fan. Blades: It goes without saying that a traditional fan requires blades. The blades are slightly twisted for maximum displacement and suction of air. Motor Fall Protection Device: Not essentially a device, but essential all the same. The motor fall protection device, as the name suggests, prevents the common motor from sliding away due to vibrations and falling down. Independent Motor: The independent motor is functionally a key component. It is what causes the basic revolution of the axle that connects it to the common motor to produce the turning effect in the fan blades. Sealed Gearbox: The sealed gearbox is where the independent motor is placed. As the gears in the gearbox revolve, it causes the larger independent motor to revolve accordingly. The gear box is mainly responsible for the speed settings of the fans. Power Line: The power line can be of various types and as the name suggests, provides the energy for the fan to work. The power line can be a traditional adapter system, or a USB power source, or simply a battery slot. Depending on the wattage of the mini fan, a suitable power source is set up. Buttons and Settings: A mini fan usually comes with an on/off toggle button, speed settings and a swing function. The on and off button is fairly self-explanatory and turns the device on or off. The speed settings usually come in three fixed speed settings – low, medium, and high. Depending on the set speed, the gearbox produces an appropriate revolution in the motor system. The swing function is somewhat optional and allows the fan head to oscillate from side to side or stay fixed as per convenience.